Indigo 9753-2 These recordings were made in the first half of 2000. Because of time problems some tracks had to be faded in and out. 1. - 4. were recorded in Istanbul on the tour to Turkey. 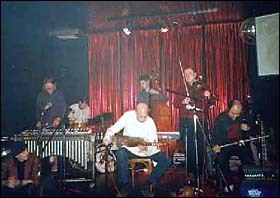 The lineup included Lothar, Karsten, Dieter, Jens and Christian, all those who had been on the road with the band in the last years. Marty Cook first played with Embryo in the 80’s. 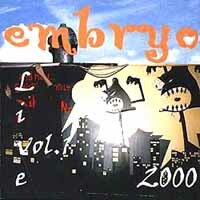 Since he had moved to Berlin, where also Michi und Larry are living, he and they always joined Embryo when they performed there. Larry has known Christian since the mid 70’s, his expressive keyboard work to be heard on track 7. Track 8 shows that he definitely has mastered the Afghan rhubab. Track 5 and 6 are a spot for the South Indian tavil player Karuna Murti, who happened to tour with Embryo in June, thanks to percussion player and friend, Christian Auer. 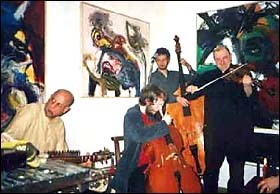 Track 5 is especially dedicated to Yulyus Golombeck, a unique guitar & oud player, who died on 1.12.2000. Since ‘76 he had been with the Embryo family. Tracks 6, 9 and 10 should give credit to all the many great musicians, who helped to give the band new ideas: Xizhi Nie, Monty Waters, Geoff Goodman, Sergey Lettov, Jurji Parfenov and Götz Lieckfeld. Masaro, Nick and Max are the "young lions" of Embryo. Bayka is the child that was born on the legendary tour to Asia in 1978.